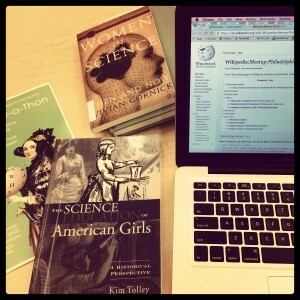 Reading up on women in STEM. 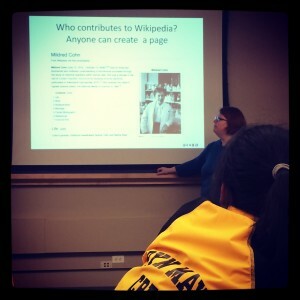 Last Wednesday at Bryn Mawr Special Collections we hosted an evening dedicated to improving Wikipedia entries on women in science, technology, engineering and math. 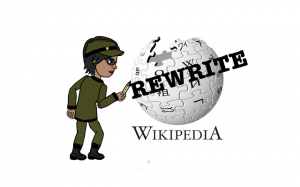 Reflecting our commitment to countering the skewed gender imbalance on Wikipedia, the event was the second Wikipedia edit-a-thon sponsored by the Greenfield Digital Center and built on the success of the #7SistersWiki gathering held in March 2014 for Women’s History Month. Mary Mark Ockerbloom introduces key concepts. 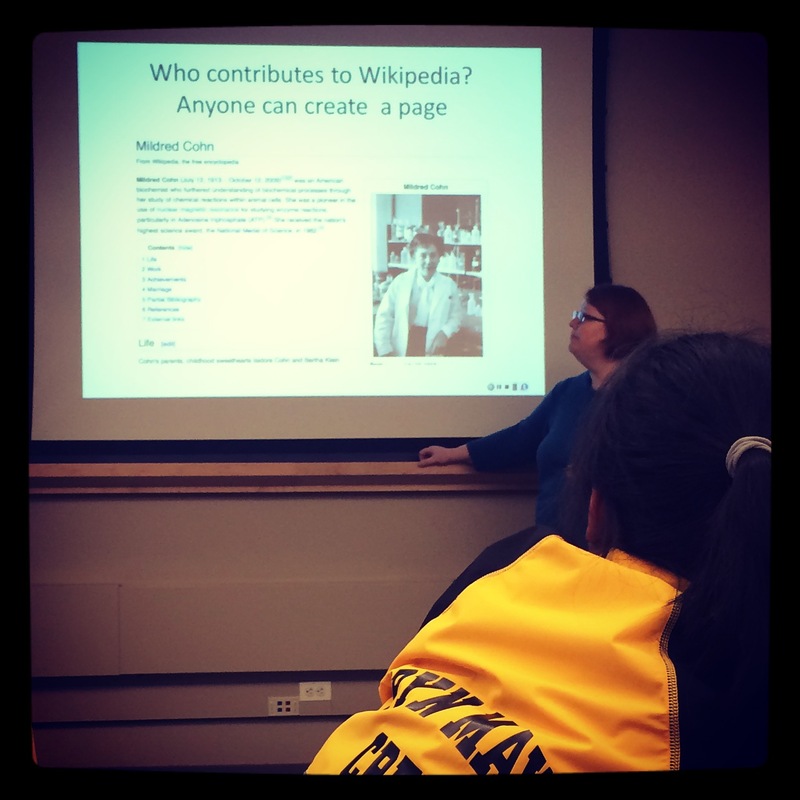 Attendees created one new article on physicist Elaine Surick Oran (Bryn Mawr College Class of 1966), which has been nominated to appear in the “Did you know” section (DYK) on the Wikipedia Main Page. Additionally, we began several other new entries for important Mawrters, including WWII cryptographer Julia Ward (Bryn Mawr College Class of 1926) and mathematician Marguerite Lehr (Bryn Mawr College Ph.D. 1923). Other participants edited existing records to reflect Bryn Mawr connections and archival collections. The group prepares to edit (must haves: laptop chargers, snacks). To follow the conversation on campus, we captured tweets from the event in a TAGSexplorer visualization tracking the hashtag #BMCwiki, and in a Storify. We were also excited to see our tweets intersect with the work of #GWWI 3, The Global Women Wikipedia Write-In organized by Postcolonial Digital Humanities during the week of October 20. 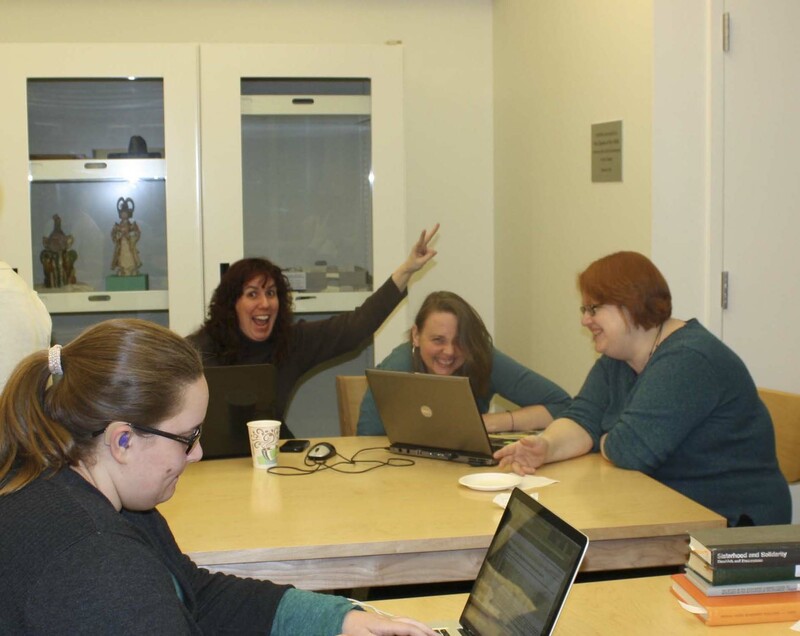 The Greenfield Digital Center looks forward to hosting our next edit-a-thon during Spring 2015, as part of the Art + Feminism Wikipedia event collective. Stay tuned for details! 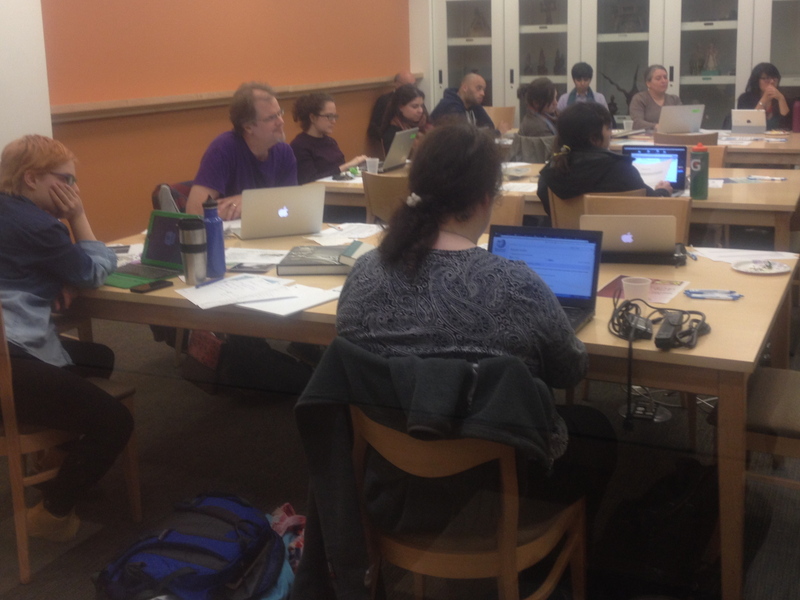 Last week we successfully hosted our first Wikipedia Edit-a-Thon! 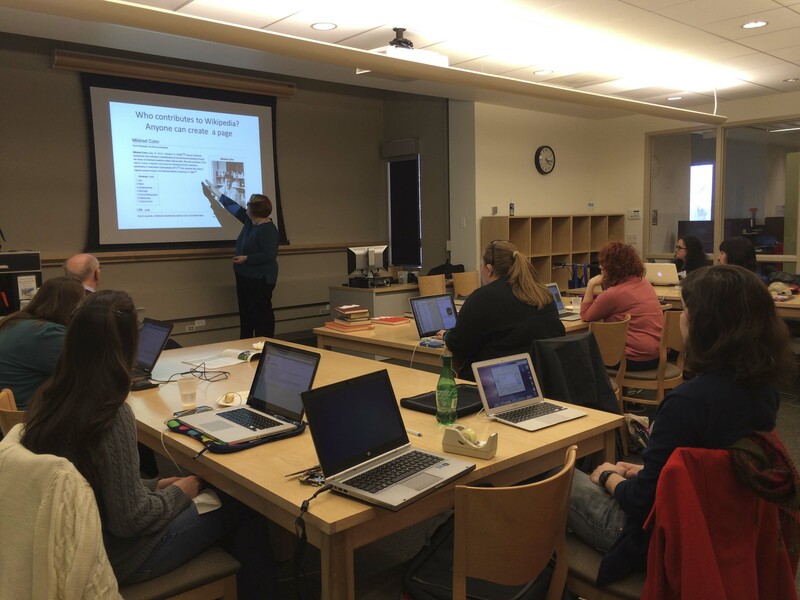 After holding a test run and gathering advice from many experienced Wikipedians during early 2014, we convened a group of eighteen on Tuesday evening in Bryn Mawr’s Canaday Library to learn the ins and outs of editing from Mary Mark Ockerbloom and help close the Wikipedia gender disparity in honor of Women’s History Month. Planning began months ahead of time, and in the days and weeks leading up to the event we solicited ideas for new pages and articles to improve from those who planned to attend. 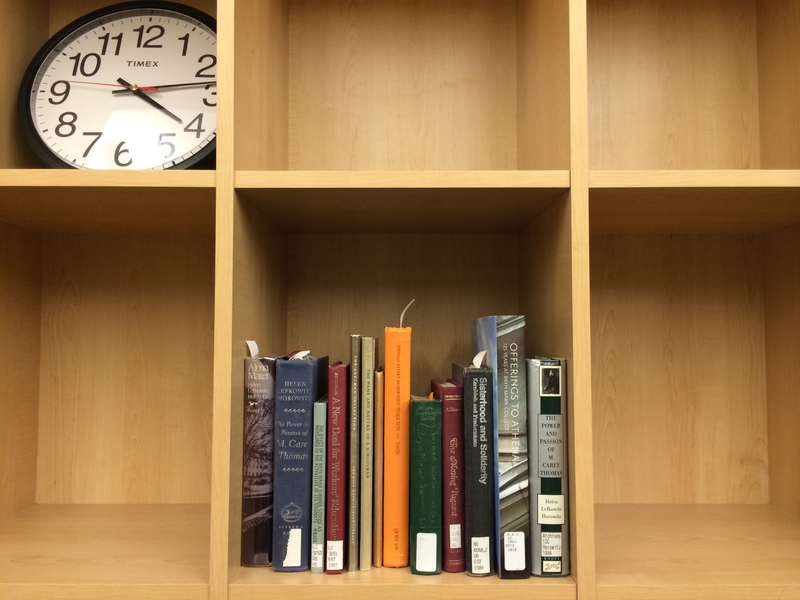 We then collected a variety of printed sources to aid us in editing and creating that content, lists of records from Bryn Mawr’s Special Collections that could be linked to existing articles, and web sources for reference. 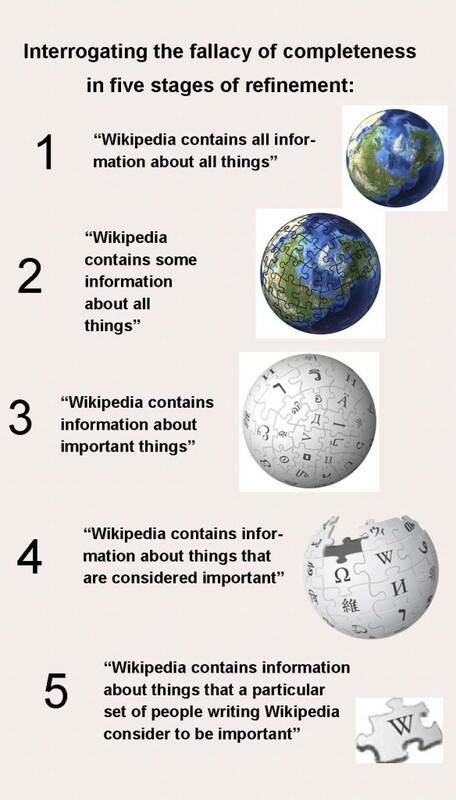 Mary opened the event with an informative talk detailing the key Wikipedia principles and culture, and methods for basic editing. Video footage of the talk is available at the bottom of this post, and slides are available here. After the presentation, we began editing our articles. Experienced Wikipedians moved around the room assisting those who were new to editing. Outcomes of the event: the Bryn Mawr Seven Sisters Wikipedia Edit-a-Thon was attended by 18 people, including seven staff members, four Bryn Mawr students, and seven local Wikipedians. 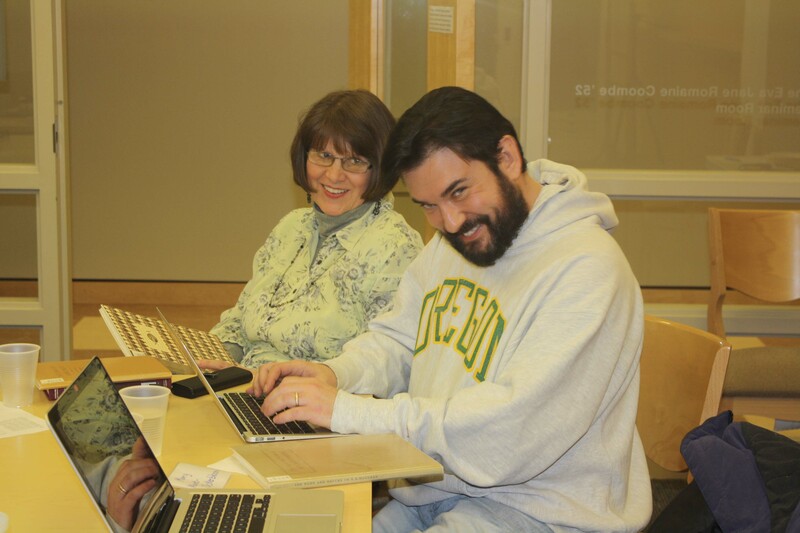 Six attendees were new to editing the site. The content we worked on is listed on the event page: together we created five new articles, two of which are public and three of which are currently in progress. We improved twelve existing articles and uploaded eleven images to Wikimedia Commons. We also created a Commons page for Bryn Mawr, so that all of the official College images we upload to Wikipedia can be centrally gathered and marked with an “institution template” that provides information about Bryn Mawr. 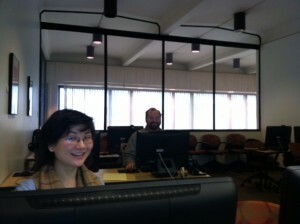 The most important outcome was empowering all 18 users to better contribute to the site as a resource for all. 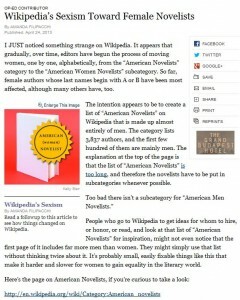 And, of course, Kimberly Wright Cassidy is no longer without Wiki-recognition! The page is very basic right now and we encourage everyone to add information to expand, improve, and interlink the information written there.